What moved an east coast high school band director to write a rhythm-and-blues chart about drum corps? What big shows are on-tap for this weekend? And, who won last week's Time Capsule contest? Dan Potter answers these questions, throws down a new Time Capsule challenge and plays some classics from the DCI archives in today's Field Pass presented by Zildjian. Download and listen. (MP3, 15:14, 14.2 MB) Have a Field Pass question, comment or request? Leave a message for Dan Potter by phone at 317.275.1212 x40 or by e-mail at fieldpass@dci.org. Subscribe to this podcast through iTunes. 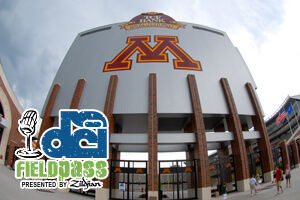 Become a fan of the Field Pass on Facebook. Visit Zildjian.com. Field Pass archive.